It is always a pleasure to feature one of our outstanding editors at Hoffman Media. Barbara Cockerham is the editor of the beloved Victoria magazine. Many of you subscribe to the magazine and devour every page. Others have asked about the magazine and its contents. Barbara has written a post explaining the lifestyle publication and sharing her thoughts on Victoria. Discovering Victoria magazine in the early ’90s was such an exhilarating experience—it seemed to provide a new way of expression for me personally and for my home. I treasured every issue. Those timeworn, hand-worn copies remain a part of my library and have traveled with me to three houses, much to the consternation of the packers and movers who handled our possessions. I have such admiration for Nancy Lindemeyer, the founding editor, who seemed to have a second sense about what women really wanted in a national publication. Although the fashions look dated and many of the advertisers are no longer around, the essence of each issue still inspires those who guard collections of the original magazine of bliss. Since Hoffman Media relaunched Victoria in December 2007, all of us involved in the publication process have, at times, struggled to explain the concept to people not familiar with our magazine. And yet our readers tell us time and time again that having the latest issue in their hands is a red-letter day, when other responsibilities take second place and the world slows a bit as they settle into a favorite spot to savor each page. The tagline just below the logo on the front cover speaks of a major portion of the content mix: Decorating, Enterprising Women, Traveling, and Entertaining. We love visiting and photographing charming homes, and you will find variety in the décor as we invite you to come inside and explore the homeowner’s preferences. We have utmost respect for women who have taken risks to follow a dream. Every year in our January/February issue, we introduce several entrepreneurs, hoping that by telling their stories we will have a small part in their ultimate success. Travel comprises several pages in each issue of Victoria. 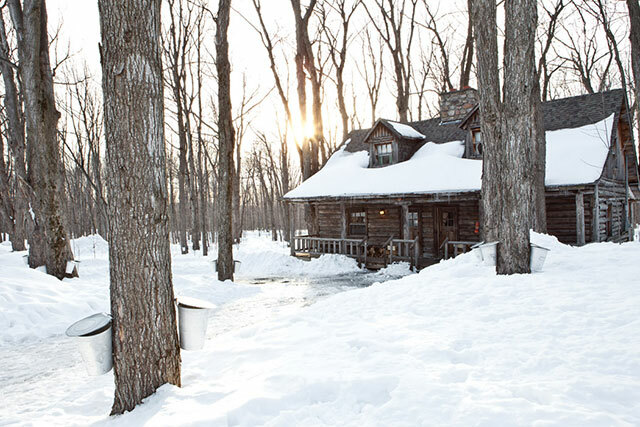 We love to highlight both well-known locales and quaint out-of-the-way places. We encourage you to keep a notebook handy as you read about destinations we have discovered so that when you are ready to book a vacation, you can easily refer to the new ones. Our favorite way to entertain is to host a dinner party, indoors or out, with foods prepared from recipes developed by our talented test kitchen staff. 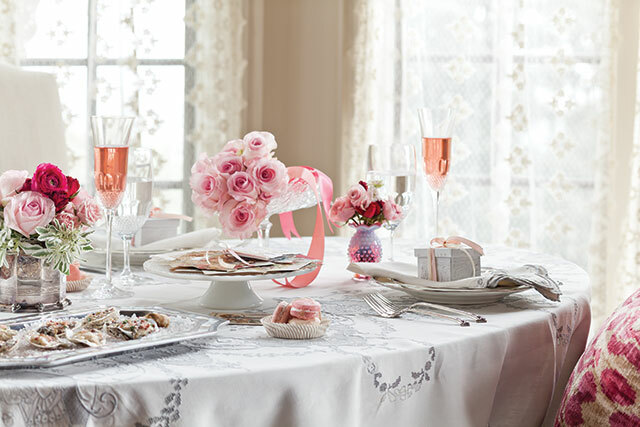 We like to use our finest linens, china, crystal, and silver to stage a lovely dinner table. 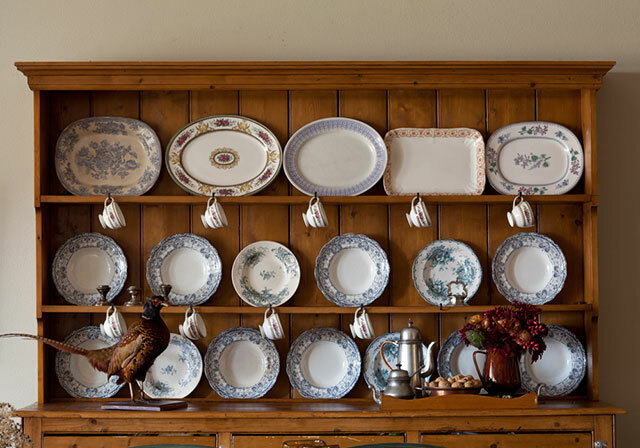 We are antiques collectors, recipients of inherited treasures, and keepers of family heritage manifested in furniture, books, and our grandmothers’ place settings of china and silver. Every day as we explore story leads, take scouting shots of interesting homes, interview shop owners, meet as a staff to brainstorm about future issues, sample foods being tested in our kitchen, write articles for the next Victoria, and enjoy the company of like-minded peers here at Hoffman Media, we are mindful of those who will be the beneficiaries of our work. With our readers, we feel we have a sisterhood, if you will, of those who long for a gracious lifestyle, where serenity and graciousness reign, with all the loveliness of the past updated and shaped for today’s world. Do you read Victoria magazine? If so, what would you like to see more of? Nancy Lindemeyer, I have cherished every one I have read, a refer to them often for decor ideas. I just added this mirror to my collection. It’s a vintage jewelry beveled mirror and very beautiful. Love your magazine! I have loved Victoria since I found my first copy on the newsstand and have saved all my copies right back to the very first issue. I would love to see the magazine published every month again and have always loved the blue and white issues as well as the ones on England.I love gardening and tea time so always love to see more of those articles. 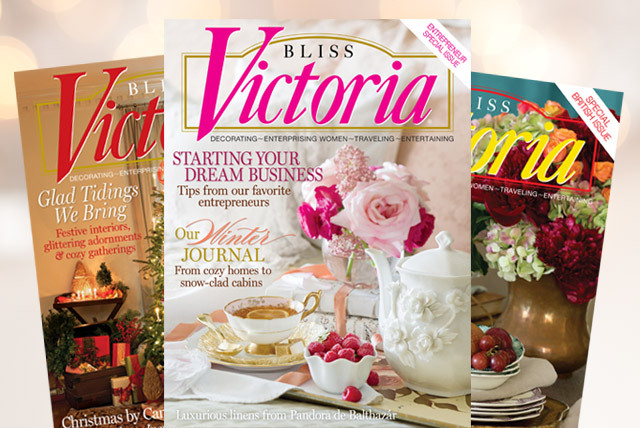 After all these years Victoria is still my favorite magazine…..I especially loved the last Christmas magazine! I love Victoria and also have every issue, even the less than ideal second incarnation. The current version pays beautiful homage to the original. I was quite fond of the dated clothes, and miss seeing those! I have every original issue since the first one in March 1987. I cherish them and they have moved with me as well. I was so delighted when you chose to resurrect this beautiful publication and you haven’t let me down! Victoria and The Cottage Journal are my favorite magazines. Thank you for providing my “quiet time” reading. I love viewing the floral gardens and shops when it’s cold and blustery outside my Michigan windows. I thought the latest issue – Our Winter Journal – was the best I’ve seen from Victoria. I loved that the articles seemed to be longer than usual, and this seemed to add a real richness to the magazine that I, unfortunately, sometimes find to be missing. I didn’t have the feeling that I was “jumping” from one short entry to the next. As I lover of the outdoors, I found the photography to be stunning. I’m a long-time reader and one-time contributor, and I say kudos to the 2015 Winter Journal. My Victoria magazine collection goes back to 1991. I have saved every issue and revisit them regularly. They have been an inspiration in so many ways. It was crushing when the old magazine ceased publication. I am very grateful that it’s back so I can again savor the graceful, beautiful, timeless photos and features in its pages. Each issue is a treat. I especially enjoy seeing the creativity of female entrepreneurs and hearing their stories. I also love the features on France, England and other European places. I miss monthly issues and wish the magazine still offered Victoria magazine cases in which readers could store their issues. What would I like to see more of? I would love to see table settings, décor and recipes for the Thanksgiving holiday. I would love to see more fashion and clothing features that show elegant and feminine garments with an “old world” sensibility. I would love to see more women of color as a reflection of the world in which we live. 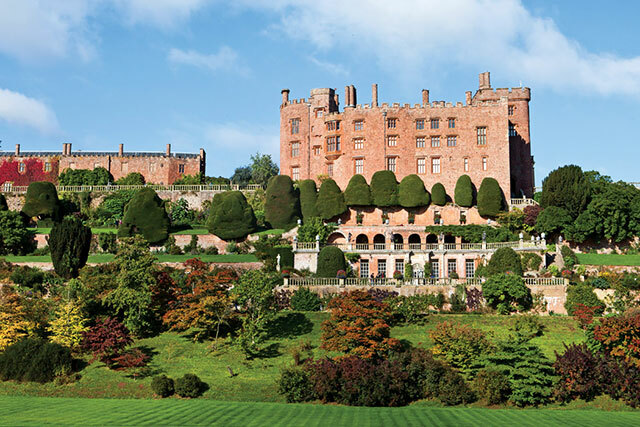 I would like to see gardens that are accurate to the issue in which they appear. Like many of your readers, I am a gardener, and when I see late summer flowers in an April issue, for example, I know I’m not looking at an early spring garden. I am deeply grateful for Victoria magazine. I read it from cover to cover each time I receive one. I also like the articles that contains the recipes and have used many of them over the years. I still have all of my copies from the first publication. I attended a Victorian Tea that was held here in Denver many years ago and would like to see something like that again come to our area. It was very special and we were able to meet others that enjoy the magazine , as well. It was arranged so that it was on a first come first serve basis to be selected to attend this lovely tea party. Thank you for all of the beautiful issues of Victoria magazine. It is a special part of my life. I agree with so many of the comments, especially those of Jane Silvey, Sylvia Faye and Jenna. Please bring back some of the charm and style of the past and help us incorporate into our lives today. I absolutely love Victoria. Please don’t ever stop! I keep every issue and have done so for years. Victoria is my very favorite magazine. I treasure them. I am an English subscriber to Victoria. I discovered my first copy in September 1992 and have loved it ever since. I was heartbroken when it ceased publication and thrilled when it was relaunched. I too had and still have huge admiration for Nancy Lindemayer, its founding editor. Much as I love every aspect of Victoria, what really resonated with me in those original copies, were the apt literary quotes to accompany a photograph or article. I especially loved articles about books and their authors. As a student of English literature, Nancy Lindemayer introduced me to America’s wonderful women writers, especially Sarah Orne Jewett, Willa Cather and Celia Thaxter. Then she opened my eyes to so many amazing American painters, especially American Impressionists such as Childe Hassam. After reading an article about Sarah Orne Jewett’s The Country of the Pointed Firs I paid my first visit to Maine where I was fortunate to forge some very special friendships, which still endure and mean a great deal to me. So thank you, Victoria, and please keep up the good work! I agree with one of the comments..loved the heading of the older V Magazines. Feature some of the Antebellum homes during the year. Feature and interview some of your elder audience as we are your biggest fans. Feature some modest homes as there are more people in that group who would appreciate relating to their lives. Feature some of the older generation of ladies & their homes. You might find them quite interesting as well as the subscribers. Special events could be held where the price could be more affordable. Ask subscribers where they would like an event to be held…then ask how many from that area could attend. The older generation are usually on a strict budget and just subscribing to your magazine is a luxury. We also love your magazines and would love to have Southern Lady as well but first choice goes to Victoria, n’est ce pas? Jo expressed my sentiments exactly – I miss the fashion pages from the old issues – old, historical dress lines reflected in modern fashion, or perhaps a vintage garment being worn again in a new age. There was a timeless quality to the old ways of “doing” modern-day things; not a desire to live as if in a historical novel with detailed accuracy, but to live out modern day life with a connection to the things of the past – a teacup, a candle, a silver stamp box, a wax seal. Bringing the past into the present, so to speak. Continuing to use the antiques, not just look at them on the shelf. How to care for the wood and silver and enamel. How to add that antique brooch to a modern-day dress. How a hat can flatter a face. Gardening – for vegetables and flowers, including techniques and color/plant combinations, perhaps to make your own miniature version of a famous garden. Table settings that glowed. These are the things that make Victoria magazine unique, and they are not hard to describe. Beautiful paper, beautiful life, beautiful homes, contentment, peace. I have every issue of the original Victoria and often look through them for inspiration. I too miss the fashion pages and would love to see their return as well. I am so happy the magazine was relaunched and continues to honor the traditions and gracious lifestyle reflected in the original. I have been a subscriber to Victoria from the beginning. I have collected each issue and have organized them by the seasons. I enjoy the winter issues during the cold winter months as well as the spring, summer and fall issues during each season. I have sought out and visited some of the shops and businesses featured in Victoria. I also refer to Victoria when planning a vacation. Victoria features the nice things of life and offers beauty in a hectic world. I love the articles on beautiful linens, embroidery and knitting. My hobbies are gardening and the needle arts as well as cooking. I look forward to every issue as well as the special issues. I only wish Victoria was a monthly magazine. I was in college, missing home, and Christmas was approaching when I discovered the first winter issue of Victoria. I stood in the campus bookstore and was thoroughly enchanted by the cover, featuring red roses and an ice skater. I was broke, but HAD to have that magazine! I took it home, opened the cover and was transported into a world of beauty and grace which has inspired my decorating style for almost 30 years! What I remember most about that first magazine was the ad for Crabtree & Evelyn potpourri, which made the entire magazine smell like Christmas! It was Magical. I still love to read that treasured copy and have collected Victoria magazines and books ever since. What do I miss? The old V letterhead and the beyond-beautiful photographs by Toshi Otsuki. 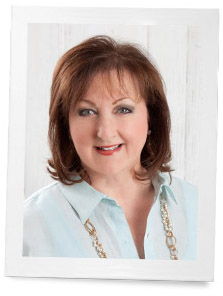 Barbara, thank you for sharing your thoughts and inspiration for Victoria magazine. I have devoured each and every issue, from the “old” to the newer ones. Victoria Magazine is elegant, inspiring a gracious way of life that never goes out of style. Each issue is filled with beauty, and encourages all of us to live a beautiful life each day. Thank you for all the hard work I know that goes into each issue, from the styling to the writing and photography, each issue is a work of art. ps. for those of you who have lost your precious earlier issues, Hoffman Media sells a cd for your computer that is searchable, it has all the old issues in one handy place. I bought this, and absolutely treasure this high tech way to read the earlier Victoria magazines! I used to store my back issues of Victoria on a shelf in my basement. When I was waiting for a load of wash to finish, i would thumb through several of those back issues. I began to realize that so many, many of them were redundant and while very pretty and nostalgic,there was seldom much that was new or stimulating. Do we really need to see another picture of a well photographed cup of tea??? I subscribed for more than a decade but haven’t for a long time. I do still buy the December issue, but other than that, I can just leaf quickly through an old copy and get a “Victoria Fix”. My favorite magazine. I have every issue. I love articles about pink depression glass, it shows me new ways to use mine. I too have Victoria magazines from the early 90’s packed in boxes in my attic; true treasures. As with so many other readers, I was delighted when Hoffman Media brought Victoria back into publication. Yes, the magazines has evolved over the years, however in our all too electronic age I understand that is essential. That being said, what remains similar to the original magazine, is a lovely publication, printed on beautiful paper that takes me to wonderful places. Please keep it coming. My big fluffy chair, my cup of tea and candle await each issue. Thank you Phyllis! I also treasure every issue, and have since the early 90s. Victoria is a delight to my heart, mind & soul. Thank you Phyllis for your leadership at Hoffman Media. I also enjoyed Colonial Homes magazine and would like to see something similar. I would like to see beautiful colonial homes that are updated for today’s living (not modern)…..traditional style. And, of course, I love Celebrate and Cottage Journal. 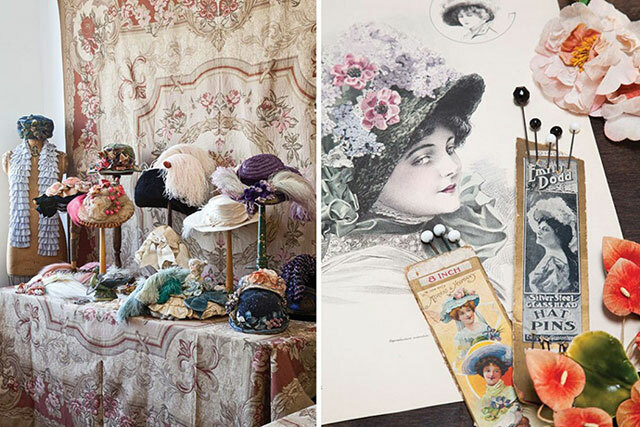 Sometimes I miss the “old” Victoria magazine, showing ladies modeling vintage clothing or stunning copies, especially replicating the ’20s and ’30s, and home décor photos that don’t seem dated at all, depending upon the period and architecture of the rooms. A case in point are the only two issues I have from the 1990s. Books, especially hand-bound books, writing papers and pens, a candle burning on the desk while paying those inevitable bills, and those recipes! ~ not to be missed but tried out and adapted and enjoyed over and over, especially the winter-rich foods. These are the stories and photographs I’d like to see more. Additional thoughts . . . since COLONIAL HOMES is apparently defunct, I’d love to see interiors of selected historical homes from time to time, such as George Washington’s beloved Mount Vernon and Thomas Jefferson’s Monticello. Readers living too far to travel to these places would enjoy a visual tour on your pages. I, too, subscribe to a number of magazines, but, if I could choose just one to continue receiving, it would be Victoria, hands down. I save them and reread them and always, always find something that I hadn’t noticed before. Wish they came out monthly, but I’ll take what I can get. The saddest time was when you went out of publication for a bit, and I’m so very glad that someone found a way to start publishing again. In a world that is frequently ugly, unkind or vulgar, Victoria brings a grace note of beauty, kindness and elegance. Thank you! I subscribe to Victoria and The Cottage Journal and enjoy both of them very much. I feel so relaxed when reading them and love to see different places in Europe and the U.S.
would be fewer articles about homes abroad and more of homes in the U.S. Two of your other publications are also favorites, Southern Lady and The Cottage Journal. Am I allowed to be a Southern Lady even though I live in far northern Idaho? lol Thank heaven it’s more of a mindset than a geographical destination. I love Victoria magazine and can’t wait to read it every time it comes…I would love to see more of England and Italy in it…lovely places…. I always appreciate seeing examples of ways to incorporate vintage-style clothing, etc., into modern life without appearing too “costume-y.” Love reading about other kindred spirits who appreciate the best of the past and suspect that sometimes we’ve thrown out the baby with the bathwater when it comes to modernization–who don’t roll their eyes and say, “Yeah, but cholera! But no air-conditioning!” when I wax nostalgic about the past. I’ve been enjoying a book called “Let’s Bring Back” by Lesley M. M. Blume that talks about things we’ve lost and sometimes miss, such as hats on gentlemen and “powder rooms” and steamer trunks. Then when I pick up Victoria and see a way to use, say, a steamer trunk in my home, maybe not for its original purpose but in some other way, I feel like I can honor the past and keep bits of it always with me. I look forward to Victoria as a refreshing respite from the harshness of modern life, but I REALLY love it when I get an inspiration for grace notes to add to my life in a practical way. I don’t have to just shut the magazine with a sigh and a wistful “Wouldn’t it be nice…” but can actually incorporate elements of a more gracious time into my everyday life. Thank you! Hi Jenny,I too have the book Let’s Bring Back and yes, Victoria magazine brings many of those things back in a different way, with fresh ideas. 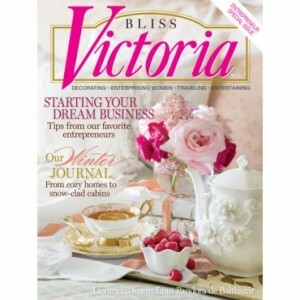 I adore my Victoria magazine and all it has to offer…would love to “live” in its pages!! I love Victoria Magazine. I usually do a post on them every month about a house tour that they feature. I get about 10 magazines a month and I must say Victoria is my favorite. It used to be Veranda but I cancelled it because the magazine is 75% ads. I found the very first edition of Victoria in the hospital gift shop while waiting for my son to come out of surgery. While waiting I read the magazine cover to cover. Since I live in the burbs I took my magazine to a local convenience store and asked that it be ordered for me. Unfortunately I lost my entire collection in a basement water leak. I started again with the next issue and now my collection sits high on the bookshelf. I can still see the skater on the cover of the first edition. I am a subscriber and when the edition arrives everything stops and I read cover to cover. When the cold Canadian winter settles in I will spend many an afternoon rereading years of Victoria. I too miss some of the old advertisers. I bought a lot from them. The only change I would suggest is to return to the original “V”. It suits the magazine much better. Thanks so much for all the wonderful afternoons over the years. A friend purchased the first copy published and shared it with me. I subscribed immediately. I would read every article and write notes beside so many and then share it with my best friend, June. She would then answer or add her notes, then return the magazine to me. June died in February of 2004 but not before reading the January issue of Victoria. I mourned when publication ceased and still rejoice over every copy the mail brings. Please change nothing for it is wonderful. It holds memories of a best friend sharing loveliness and bliss.